This BT Synergy 6500 telephone gives you the freedom to talk and walk around your home up to 50 meters or if outside, up to 300 meters. A 10 hour talk-time battery life ensures plenty of power to handle even the longest of conversations, whilst the built-in memory can store up to 250 names and numbers, giving you quick access to friends and family with the touch of a few buttons. 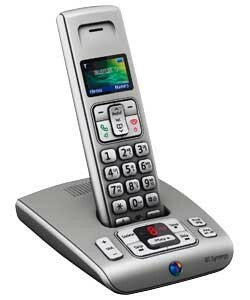 This cordless telephone also features a caller display with a 30 number call log, a text messaging facility with storage for 50 messages, and with the built-in SIM card reader and writer, you can transfer and store your contacts direct to this BT Synergy phone effortlessly. A built-in answering machine allows you up to 30 minutes recording time, and there are 20 ringer melodies to choose from to keep you amused for those days when a simple ring tone just isn't enough.